October 16 2016. 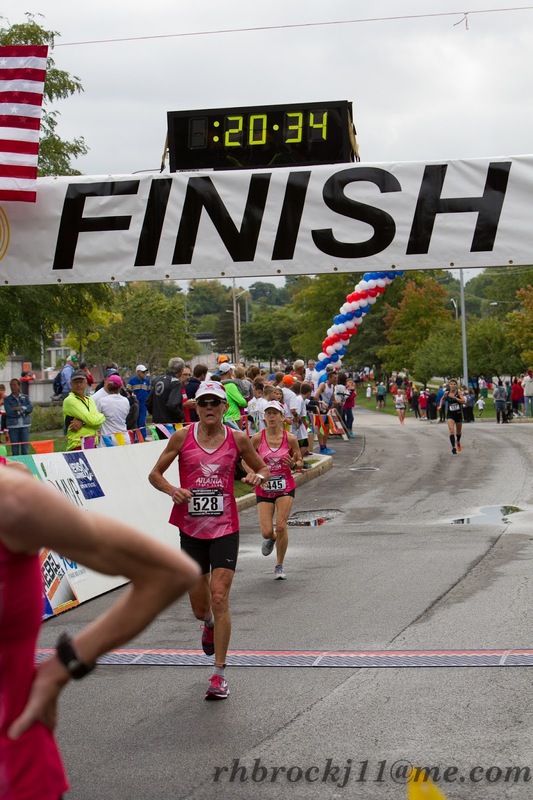 This is the final installment for the 2016 5K Masters Championships. The main focus is on teams. 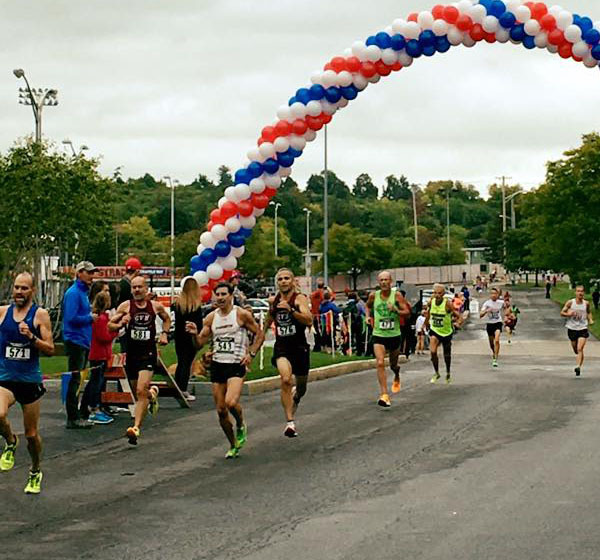 Many runners come to this and other events on the USATF Grand Prix Circuit in order to compete for their team. They are not focused primarily on individual wins although some achieve that in passing. As always there were some tight competitive team races. In road racing the Team Score is based on the top three runners and rather than add up finishing position, the actual times are summed up. Every second counts so it is said that gives a great incentive to each runner on the team. But it also means having a single dominant runner, or not, can have a huge effect on the final outcome. 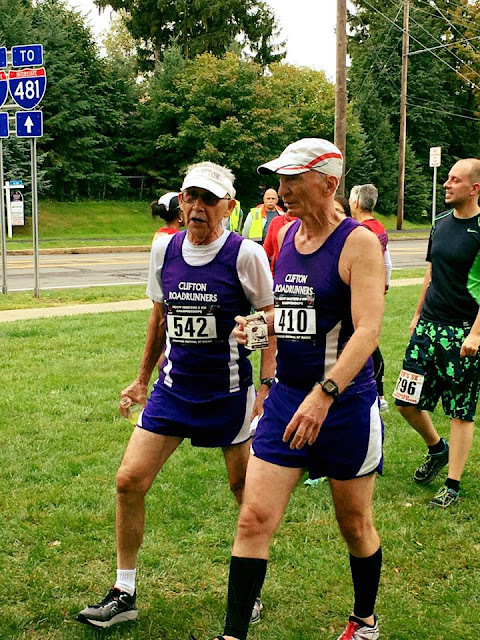 Most runners on 40+ teams are between the ages of 40 and 49 but the '+' means that anyone older than 40 can compete and the same for 50+ and so on. 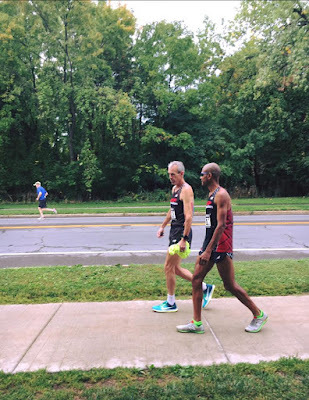 It is not all that unusual for a strong older runner to be added to a team as insurance or just to replace an injured teammate or because some of the stronger runners are fast enough. Then it is a strategic question. Will a 50 year old Kristian Blaich, for example, do more good to a 40's team or a 50's team? Here are the team contests. Men 40+. 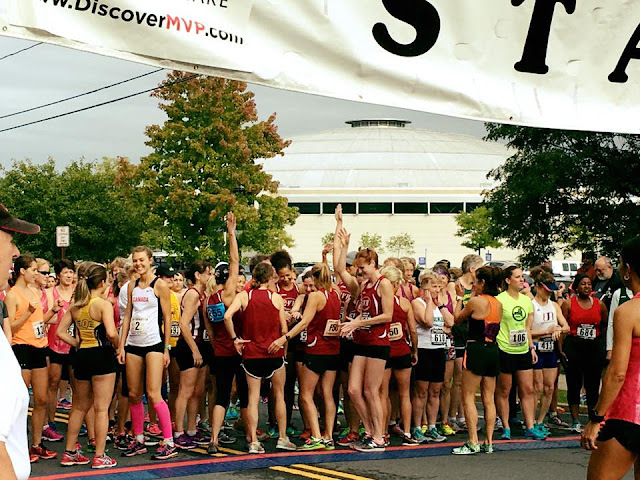 Six different Clubs entered a total of 7 teams: Atlanta Track Club, Central Mass Striders, Syracuse Chargers TC, Syracuse TC, TNT International A and B [Philly], and the Willow Street AC [Albany NY]. Atlanta is the defending champion with three runners under 16:00 last year. But two of Atlanta's top 3 were not back this year (Black and Newton) and their third, Blaich, had been injured since the early spring. If Blaich were fully recovered then, along with Aaron Totten-Lancaster, who ran 33:22 in the 10K at Dedham, that gives them two sub-16 minute runners. Greg Putnam and Tim Van Orden ran 33:02 and 34:02 at Dedham. Once the gun went off any uncertainty about Blaich's fitness evaporated as Putnam and Van Orden moved quickly to match his early pace. Totten-Lancaster was moving even faster, a few strides ahead of Blaich. But just before the halfway point, Putnam and Van Orden surged to break up the 1-2 of Totten-Lancaster and Blaich. They crossed the halfway mat with Totten-Lancaster at 7:47, Putnam at 7:49, Van Orden at 7:50 and Blaich at 7:51. Would Blake's fitness hold up? If not, Central Mass might have it their way. And what of the #3 runners for each team, Joe Shairs for Central Mass and Thomas Carroll for Atlanta. Here Atlanta had a bit of an edge as Carroll was at 8:02 with Shairs at 8:14. Atlanta had to hope that Carroll could build on that gap and that Blaich could hang tight in the top 4. Central Mass, of course, was hoping that Putam and Van Orden could pull away from one or both of the Atlanta leaders and that Shairs could close up on Carroll. As it turned out, things went Atlanta's way as Totten-Lancaster held onto his lead. It was a brave surge from Putnam and Van Orden but Blaich was able to regroup and answer. In the end he had a 4 second lead on Putnam with another 5 back to Van Orden. That meant Atlanta was in the Gold unless Shairs could not only close up on but pass Carroll. That was not to be, at least not on this day, as Carroll pulled away and added a 29 second gap to Atlanta's advantage. Atlanta got the Gold with a 15:58 average, with Central Mass in 2nd place with 16:14 per runner. Those were the clubs in the money. Women 40+. As with the men, six clubs and 7 teams contested the division. Again, TNT International fielded two teams: Atlanta Track Club, Genesee Valley Harriers [Rochester NY], Philadelphia Masters, Syracuse Track Club, Team Rogue [Austin TX], TNT International-A and B. The Genesee Valley club is the defending champion but two of their top 3 are different this year. Syracuse took 2nd and should run faster this year as local stalwart, Sascha Scott is running for them this year. But the two outside teams from Atlanta and Austin must be reckoned with. Atlanta did not send their A team last year and Team Rogue did not contest the 40+ team race. With Sonja Friend-Uhl recovered enough to run at least in the low 18 minute range and Holly Ortlund and Irma Dennard both primed to run under 20 minutes, they were strong favorites, with Team Rogue next, the only other team with three runners likely to break 20 minutes. For the 3rd spot on the podium, Scott would give Syracuse a good start but Genesee would rely on a tighter pack of runners. Atlanta took the suspense out early. Friend-Uhl was running right with Scott up front and sped across the halfway mat in 8:48 with Ortlund only 5 seconds back, and Dennard only 4 seconds behind her. With a fast, tight 3-pack, Atlanta would be a tough team to beat. Team Rogue certainly gave it their best. Cassandra Henkiel was only 2 seconds back from Dennard but then it was over half a minute back to Mandy Plante and Carmen Ayala-Troncoso, the 57 year old Hall of Famer, running with the 40's. That was a lot of time to make up in a 5K and it was not to be.Atlanta got a solid victory, averaging 18:11 to Team Rogue's 19:15. In fact, GVH was closer to beating Team Rogue for Silver than Team Rogue was to getting the Gold. At the half way point, Genesee's top runner, Heather Webster, was 5 seconds ahead of Rogue's Henkiel and their 2nd runner, Wakenda Tyler was 4 seconds ahead of Dennard. But Ayala-Troncoso, at 9:39, had over 40 seconds on Rogue's 3rd runner, Caroline Bucci. Everyone ran tough over the second half with Henkiel and Plante closing ever so slightly on Webster and Tyler but not enough to reverse the time advantage fo those two. But Ayala-Troncoso added to her lead and that was the story as Team Rogue's 19:15 average bettered GVH's 19:34. 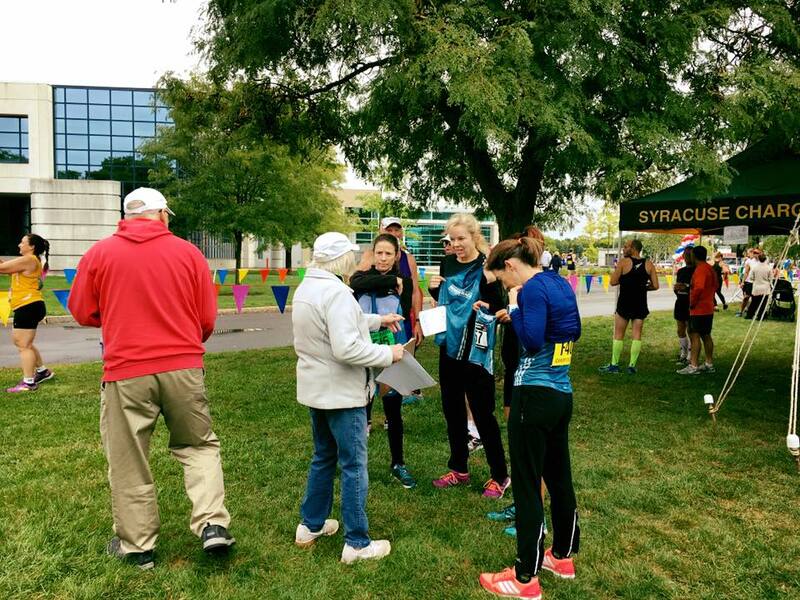 The Syracuse Track Club (Scott, Karyl Sargent, and Kathleen Wheeler) finished 4th with a 20:24 average. Atlanta TC 54:32, Team Rogue 57:45, Genesee Valley Harriers 58:40. Men 50+. This was a barn burner of a race with the top 5 teams finishing, on average, within a minute of each other. There was a spread of 17 seconds per runner for 2nd through 5th. Wow, that's close; every runner had to come through for the team! Playmakers Elite/New Balance [Lansing MI] are the defending champions with GVH and the Atlanta TC coming in 2nd and 3rd last year. 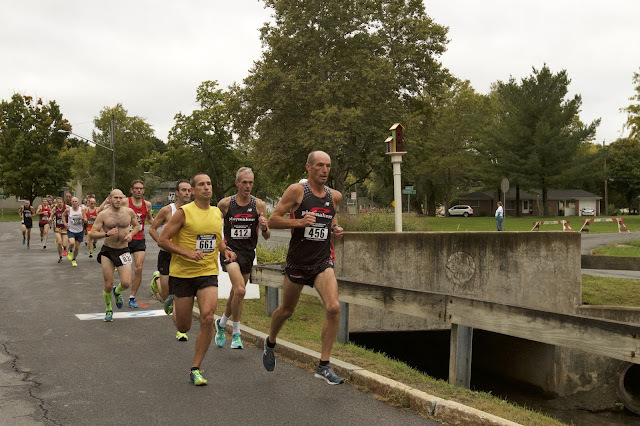 Playmakers knew it would be a struggle this year as two newcomers both brought strength, the Greater Springfield Harriers [Springfield MA], with a lead runner, Nat Larson, who was likely to be the first runner in for a team, and Francis Burdett, who would not be far back. Their success would likely depend on how close their third runner, touted by Burdett as the 'fastest CEO in the country', Ron Lombardi, could stay to those two. Cal Coast TC [Southern Cal] originally had the strongest team but when Pete Magill had to withdraw with a hamstring issue, that cost the team well over two minutes, too much to overcome for a win. Still, with Rob Arsenault leading the way for Matt Ebiner and Rob's brother Dan, they would definitely be in the mix for a podium spot. Over the first half of the race, there were a bunch of runners pretty close to the front.Springfield's Larson was leading the way at 7:51. Cal Coast's R. Arsenault was five seconds back, breaking up the top two Springfield runners as Burdett was only 2 seconds back. If Burdett could stay up tight with Arsenault like that, it would spell trouble for the other teams. 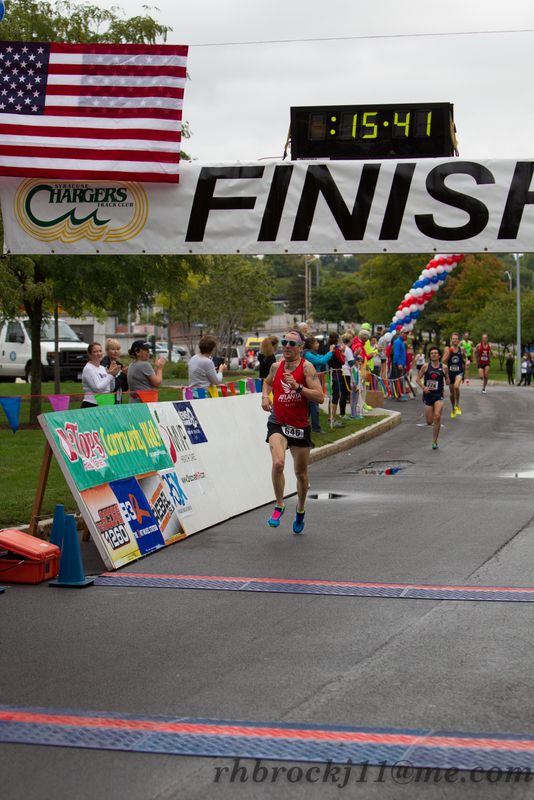 The defending champs, Playmakers, came next with a trio of runners, Ruben Henderson at 8:13 and 5 seconds later, Dave Bussard and Kerry Barnett. Henderson has a reputation of starting a bit faster than he finishes so Playmakers was not home free yet, but it was a good start. The worrying thing, if they had known it, was that Springfield's 3rd runner, Lombardi, was only 4 seconds behind them. Atlanta's Michael Strickland broke up the Playmaker's top 3 at 8:15 but his teammates were not with him. GVH's 'twins' Alan Evans and Mike Nier were up next at 8:24, but their teammate, Joseph Mora III, who ran so great at the 1 mile championship was 11 seconds back. Atlanta's Jeff Haertel was a second behind the GVH guys, with teammate Gary Droze a dozen seconds back. What about Cal Coast? Ebiner was in between Haertel and Mora, with D. Arsenault 6 seconds behind Droze.At that point Springfield should have been feeling pretty good about their chances. Playmakers, except for the fact that they want to win so badly, shouldn't have been feeling too bad. Atlanta, Cal Coast and GVH knew they needed someone to step up if they were going to move ahead of the two leading clubs. Over the second half of the race there were some minor rearrangements but mostly runners held their place. Greater Springfield's Larson, Burdett, and Lombardi all held their positions in the race; in fact, Lombardi moved up a couple of spots. They were rewarded with the Gold Medal on an average time of 16:33. Henderson did fade a little for Paymakers, although that could also have been due to the killer work schedule Henderson has had to endure over the latter part of his race prep. But he stayed tight enough on Bussard and Barnett that Playmaker Elite held onto 2nd with an average of 17:04, but it was tight. They only had 3 seconds per runner on Cal Coast. Atlanta's Droze moved up with a very evenly paced race but it was not enough to make the podium as they averaged 17:17 per runner. And GVH was tight up on them at 17:21 per runner. You can bet all these teams will be heading to Tallahassee and Club XC with their eyes on maintaining their edge or getting even! Greater Springfield Harriers 49:39, Playmakers Ellite/New Balance 51:11, Cal Coast TC 51:20. Women's 50+. Six clubs contested this division. Last year the Athena Track Club A and B teams finished 1-2 but there is more competition this year. Still Athena was clearly the team to beat with Marisa Sutera Strange heading up their team. Having a sub-18 minute runner on your team always helps, especially when the rest of your runners are pretty strong too. If Strange ran her usual race, it seemed unlikely that any of the Clubs could stay with them but there would e a hack of a race for the rest of the podium. 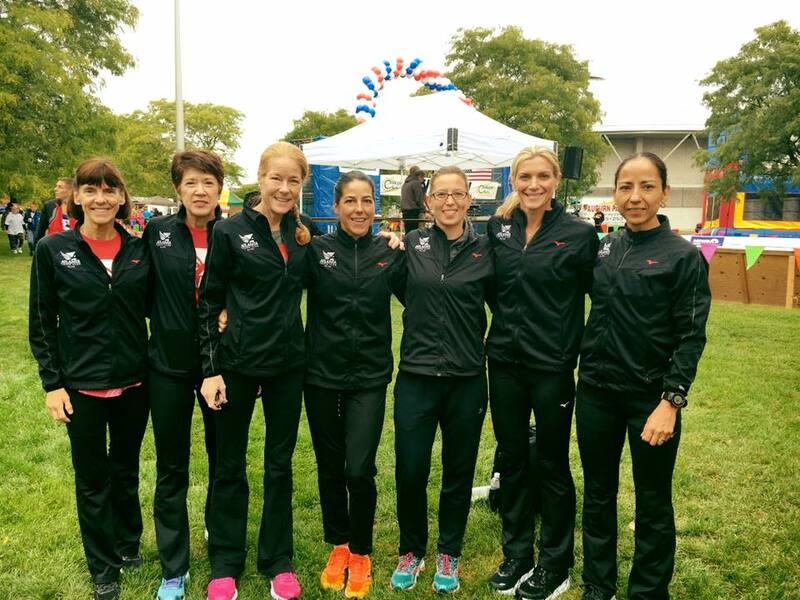 The new team on the block, the New Balance Tampa Masters (FL), who were featured in the July issue of National Masters News, were led by Susan 'Lynn' Cooke who might well break 20 and two other strong runners. 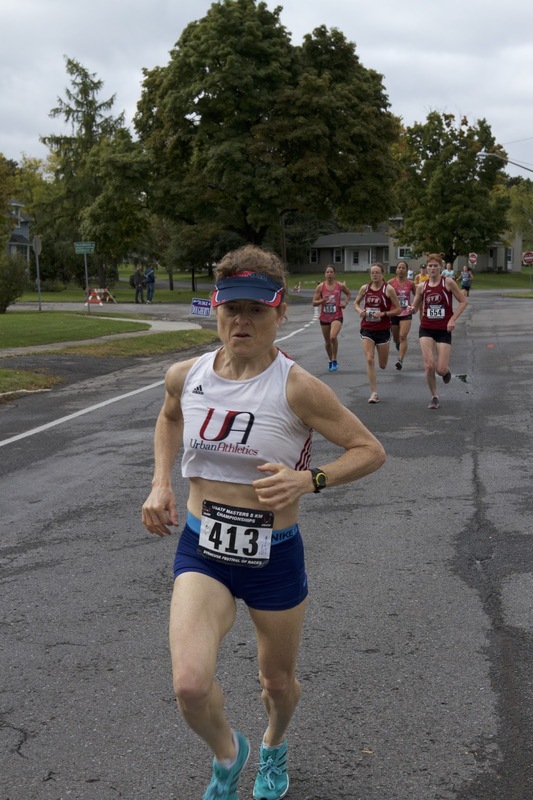 The Clifton Roadrunners [NJ] had a similar team in that Suzanne LaBurt would likely crack 20 minutes. The Atlanta TC and GVH hoped to counter with teams that would rely on a tight pack rather than a fast leader. Athena's Strange took off as usual and crossed the halfway point in 8:49. So unless the other Athena runners fell off badly, they looked good for the win. Thirty seconds later the next runner came across and, to me at least, was a bit fo a surpris, Tampa's Trish Butler, who I thought would play a supporting role. Clifton's LaBurt was a dozen seconds back with GVH's Kathleen Hayden 5 seconds back. When Tampa's Cooke came across 7 seconds later, it looked like Tampa might actually be able to challenge Athena. But Athena's Mary Swan was 8 seconds back so Athena was still in good shape. After Atlanta's Laurie Wharton came across 4 seconds later, with Athena's Julie Pangburn right on her heels, it was clear Athena had little to worry about. Atlanta's Patrice Combs and Paula Johnson crossed in 10:03 and 10:04 respectively, Atlanta had their first 3 runners accounted for. But it was only a second back to Tampa's 3rd runner, Michelle Allen so things were still looking good for them.But it was starting to look like Clifton and GVH would be off the podium as their 2nd and 3rd runners were still yet to reach the halfway point. And that is how it turned out. Strange came across first with a 67 second bulge on Tampa's Butler. When Swan came across 4th with a half minute gap on Tampa's Cooke, who was having an off day, that pretty much sealed the win. Pangburn, as it turned out, also had an edge over Allen so that gave Athena the win with a 19:31 average to Tampa's 20:13. The only other question was whether the tight 3-pack of Atlanta would outperform the LaBurt led Clifton team to land in the third podium position. LaBurt finished in 19:34 and it was almost a full minute before Atlanta's Wharton finished. But then Johnson and Combs came in 7 and 9 seconds later respectively to put the pressure on. Laura Delea finished in 20:55 for Clifton which meant that if their 3rd runner, Kerry Monahan, could finish in 31:08 or less, Clifton would get the Bronze medal. But despite her best efforts, Clifton came up just short, an average of 20:34 per runner to Atlanta's 20:33. GVH averaged 21:09. Athena TC 58:31, New Balance Tampa 1:00:37, Atlanta TC 1:01:37. Men 60+. Seven clubs fielded 8 teams to contest the division. GVH fielded an A and a B team. The defending Champions, the Boulder Road Runners were back but only one of their 2015 top three was back, Hall of Famer, Doug Bell. Cal Coast TC also brought a very competitive squad, perhaps the only other team with 3 runners likely to break 20 minutes. Shore AC would ordinarily be in that class as well but their top runner, Reno Stirrat, sustained a freak ankle injury a week before the race and had his foot in a boot. Without Stirrat in the lineup they would be playing catch-up. Still, sub-20 minute runners, Patrick Gaughan and Scott Linnell would at least keep them in the hunt for a podium position. GVH would likely need a healthy Mark Rybinski to lead them to a podium finish. Just returning from an injury, Rybinski is probably not at full fitness yet. And the Atlanta TC and Syracuse TC are in the same boat with only one runner under 20 minutes. Atlanta hopes fo rbetter times in the future; Ken Youngers ran for them in the 1 Mile Championships but now has a surgery to recover from. Rumor has it that Tom McCormick is recovered and running well now and may rejoin them at Tallahassee. Ann Arbor TC has 3 solid runners but without the likes of Terry McCluskey and Lloyd Hansen, they do not have the speed up front to contend. Things were looking good for Boulder when Bell sped across the halfway mat in 9:01 with his teammate, Kyle Hubbart, in 2nd, only 11 seconds back and gaining. Worrisome, however, was the Cal Coast trio of John Holcomb, Perry Forrester and Keith Witthauer, in that order, all within 3 seconds of Hubbart. GVH's Rybinski was right with that trio but his number 2 runner, Bill Beyerbach was a dozen seconds back. Syracuse's Brian Cummins was right on Rybinski's heels but their 2nd runner was way back. Shore's 2nd runner, Scott Linnell, came along next at 9:25, with Boulder's number 3, George Braun, right on his heels along with GVH's #2, Beyerbach. Shore's 2nd runner, Gaughan, was a few seconds behind Beyerbach, keeping Shore in the hunt and it helped that even though Shore's 3rd runner, Mark Chiusano, was almost half a minute back from Gaughan, no other team had a runner between them. GVH's third runner,Tony Gingello was 8 seconds behind Chiusano. If Bell and Hubbart could maintain their 1-2 standing it appeared that Braun was close enough to deliver the victory. If none of them faltered, Cal Coast, despite its tight 3-pack, would have to settle for 2nd. If Gaughan and Linnell could hang tight with Beyerbach and if Chiusano could stay ahead of Gingello, Shore should claim the bronze. And that is how it turned out. Hubbart and Bell took 1-2 but with the order reversed from halfway. Braun finished in 10th and broke 20 minutes to seal the victory with an average of 18:56. Shore's Gaughan came on strong to break up the Cal Coast trio but that was not enough to derail their Silver Medal race. Holcomb, Forrester and Witthauer all finished from 19:05 to 19:17, demonstrating a strong team consistency. Shore AC's runners had a good last 1.55 miles. Gaughan, as noted, came on strong, passing Linnell and Witthauer. But Linnell also expanded his gap over Beyerbach from 2 seconds ot over half a minute, and Chiusano upped his margin over Gingello. Shore averaged 19:48 to claim the Bronze medal. GVH was just off the podium with a 19:57 average followed by Syracuse at 20:04, Atlanta at 201:13 and Ann Arbor at 20:26. Boulder Road Runners 56:47, Cal Coast TC 57:28, Shore AC 59:23. Women's 60+. GVH was the defending champion but their women's 60+ team has not been heard from yet this year. I hope all are okay and just too busy to make the trips. Two new teams contested the division this year, the Atlanta TC and the Impala Racing Team (SF Bay Area). 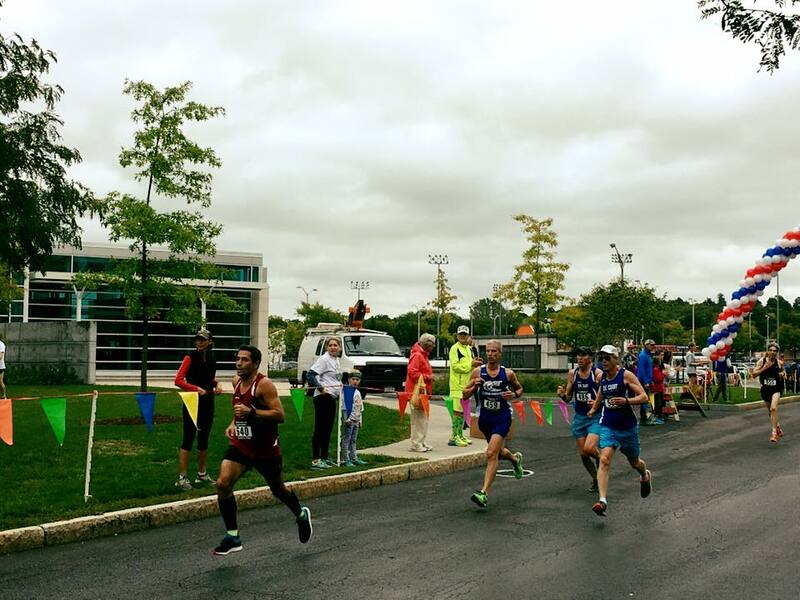 Impala hoped to duplicate the race they had in Dedham MA at the 10K championships where they took the division gold medal. Unfortunately, Mo Bartley, their top runner at Dedham, did not make the trip so Dianne Anderson gamely agreed to be their third runner. Atlanta came loaded with their top 60's runners so the contest was a little uneven. Atlanta's Nancy Stewart zipped across the halfway mat in 9:43 and it was a minute more before Impala's Jill Miller-Robinett crossed. Sixteen seconds later Margaret Taylor crossed for Atlanta, followed by her teammate, Cynthia Williams, a few seconds later. That pretty much settled things unless someone's pacing was way off. Impala's Jo Anne Rowland came along a half minute later, and then a bit further back, Anderson. There were no changes in order over the seocnd half of the race so that's the way they finished. Atlanta took the victory with a 21:58 per runner average and Impala took the Silver Medal. Atlanta TC 1:05:52, Impala Racing 1:12:56. Men's 70+. Six teams contested the division. It is probably easier to say who should not be favored than who should. The Ann Arbor TC has been a power in the past and the defending champion, but none of their top 3 from last year are running this year. Doug Goodhue and Monte Piliawsky, their usual 1-2 punch, are both out. Ann Arbor's top runner this year is likely to be Paul Carlin (that's me). But after running the 10K in 42:19 (net) in April, I strained my left hamstring and was in Physical Therapy until mid-September. Rather than aiming for something around 20, getting in under 22 will be the main goal. Needless to say that will not be competitive enough to carry a team. Atlanta TC is another strong team but their number 1 runner,Ron Mastin is perhaps even further from being fit than I am so they probably are out. The Clifton Road Runners will compete but it is hard to hit a top 3 70's finish when none of your runners are under 74. That leaves three teams, the Genesee Valley Harriers, the New England 65 Plus Runners, and the Shore AC. It seemed like the top runners for GVH and Shore, Jim May and Przemek Nowicki respectively, should fight it out for the win, with a time somewhere around 21:00. The 2nd and 3rd runners for GVH appear to be slightly stronger than the 2nd two for Shore but it is likely to be close and will depend on who has a better day. the NE65+ team should have a good shot at the Bronze Medal; their top three runners could all well fall between 24 and 25 minutes. Ann Arbor and Atlant are probably fighting over 4th and 5th with the outcome probably depending on how strong a race Mastin can run. GVH had the first runner across the halfway mat in 10:00. With a 24 second lead over Nowicki, GVH was off to a good start. Twenty seconds later, I came across the mat headed toward my predicted sub 22 minute time. Twenty seconds after that, in 11:03, Milton Schumacher was the first runner across the mat for the NE 65+. That suggested the NE65+ team might be better than anticipated. That became even clearer when the ext runner up was also from NE65+, Joe Noonan in 11:23. Luckily for GVH and Shore, their other runners were coming next, GVH's Liam Finnigan in 11:29 with Shore's number 2 runner, Ed Smith, on his shoulder. Then came the third runners for NE65 and Shore, Robert Knight, and JL Seymore in 11:36. Two seconds back was GVH's 3rd runner at this stage, Jim Glinsky, with Atlanta's Fran White on his shoulder. Now the top 3 teams all had their top 3 runners across the hd the two leaders as the group ran impressively faster than predicted at least through the first half of the race. alfway mat. at that stage it was looking At this point it was looking good for GVH. The 24 second advantage of May over Nowicki was good as the 2nd and 3rd runners for GVH and Shore were running very close. 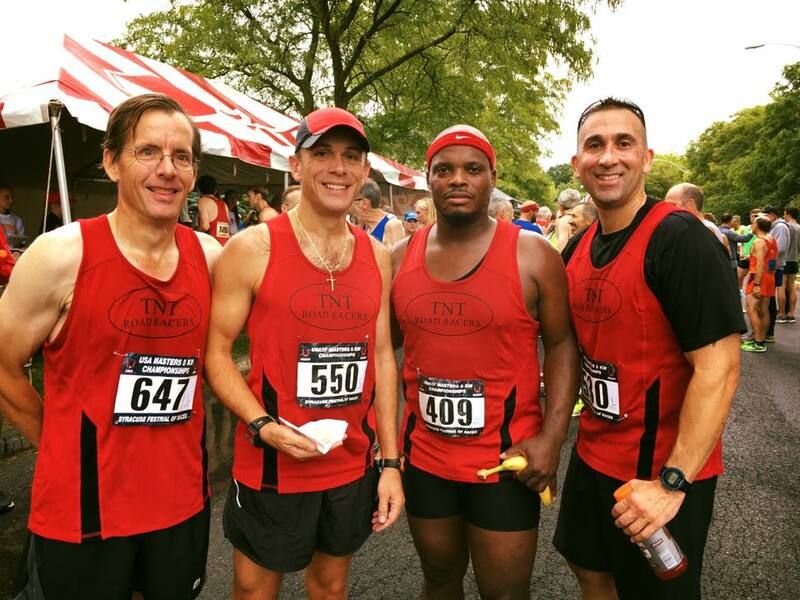 The big surprise was that the NE65+ team was not far behind, all 3 on pace to break 24 minutes. Over the second half, May held strong and stretched his lead over Nowicki to 42 seconds. While Finnigan faded a little, Glinsky did better so that was a wash for GVH and allowed them to claim the victory with a 22:48 average. Although Nowicki did not do as well as May over the last 2.5K, the only chaser who closed the gap on him was me and Ann Arbor was not in contention. Nowicki stretched the gap with NE 65's Schumacher from 39 seconds to nearly a minute and that was enough to offset the gains made by the other two NE65+ runners on the 2nd and 3rd Shore runners. 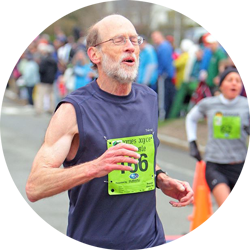 Shore finished 2nd with 23:12 per runner, a mere 5 seconds per runner ahead of the NE65+ club, much closer than expected--Well done, NE 65+! Atlanta was just off the podium with a 25:46 average and Ann Arbor TC 4 seconds per runner slower. GVH 1:08:24, Shore AC 1:09:35, New England 65 Plus Runners Club 1:09:49. Women's 70+. Two teams contest this division, the Syracuse Chargers TC and the Checkers AC [Buffalo NY]. The Syracuse Chargers are definitely the favorites as their top 4 runners, Sue Gardinier, Mary Casey, Rosemary Laquidari, and Carol Rider are all likely to break 35 minutes and it is unlikely that the Checkers runners, Fran Rowe, Christa Maier, and Edna Hyer, will be able to match that. Most likely the Checkers AC team was happy to run the race, have a good time, and pick up the Silver Medal.The Chargers took the Gold medal with an average time of 30:03 and the Checkers came in at 37:33 per runner for the Silver Medal. Syracuse Chargers TC 1:30:07, Checkers AC 1:52:38. Congratulations to all these great teams. It leaves me eagerly anticipating the ferocious team contests we will see at the Club Cross Country race in Tallahassee in December. But first we have the last road Championship race of 2016, the USATF 15K Championship at the Tulsa Run in Tulsa Oklahoma on the last Saturday in October, the 29th! 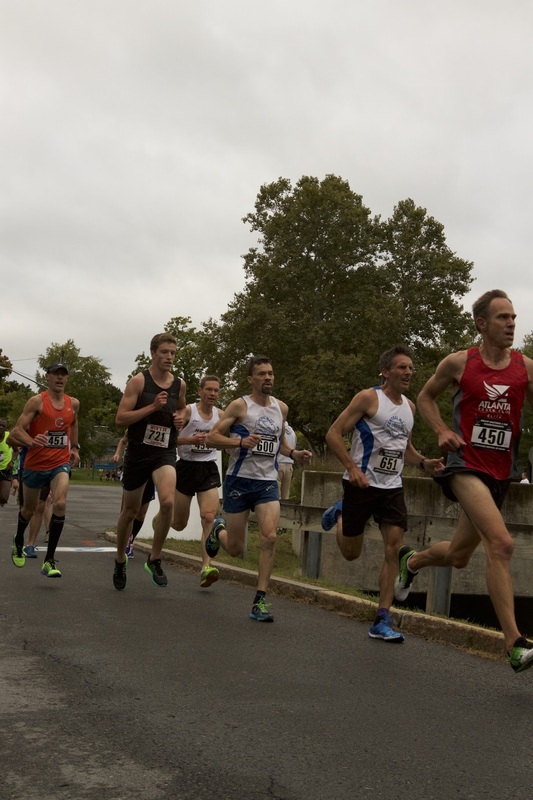 Other teams in contention included the Greater Springfield Harriers with 30 points and the Central Mass Striders with 39. Other teams in contention included Team Rogue (Ayala-Troncoso-Henkiel, Plante) with 47 points and the Impala Racing team (Miller-Robinett, Rowland, Anderson) with 56 points.